www.mahapariksha.gov.in. Last date for online application form for this Gram Sevak Jobs is 16-04-2019. Exam pattern and Syllabus, District wise Gram Sevak vacancies are updated below for this Mahapariksha recruitment 2019. 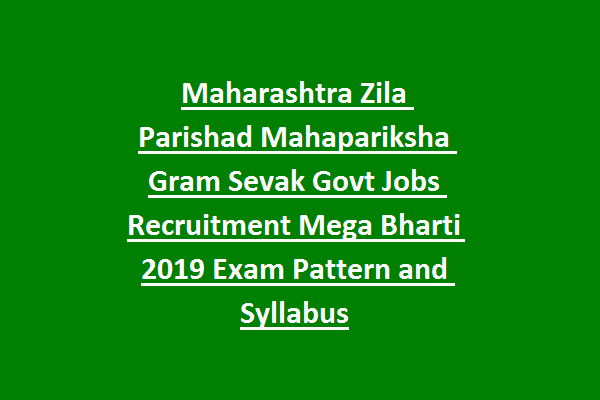 Maharashtra Zila Parishad Recruitment of Gram Sevak posts detailed information is updated below. There are 1034 vacancies are in this Mahapariksha Zila Parishad Gram Sevak Recruitment 2019. Age limits for this Gram Sevak Jobs is 18-38 years. For reserved candidates is 18-43 years. Rs.500/- for open category candidates and Rs.250/- for all other candidates. Candidates selection is on basis written exam (objective type) which will be conducted for 200 Marks. Total 100 questions will be given for 5 sections. 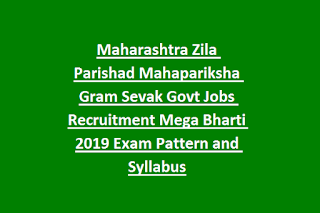 Apply online here for Maharashtra Zila Parishad Rural Development Department Gram Sevak recruitment 2019 on or before 16-04-2019 via official website of www.mahapariksha.gov.in/.